My wife and I are fans of the TV show “The Walking Dead” but not because it is a zombie show. We use the show as a teaching tool. As we watch the show, we discuss the situations that the characters encounter. My wife and I do a, what if we were in that situation. How would we handle that situation differently? Yes I know some of the situations that are in the “Walking Dead” are totally unrealistic. One of our BIG problems that my wife and I have with the “Walking Dead” TV series is, where do they get all of their ammunition? They seem to shoot and shoot yet always have all the ammo they need on their person and never run out. This brought up two (2) interesting questions. How much ammo should we carry, on our person, in a SHTF situation, if we are on foot? What is the plan if we run out of ammo during that type of situation? How would we defend ourselves when the ammo runs out? I conducted a little research and found out that at the beginning of the Vietnam war, our troops carried the M-14 rifle which fires the 7.62mm/.308 Win. round. The standard ammo load for the M-14 rifle that a typical soldier carried, at that time, was 100 rounds. It was quickly discovered that in a close combat situation, such as the Vietnam, soldiers were quickly running out of ammunition. Getting them more ammo in the jungles of Vietnam, during a fire fight, was extremely difficult. A lot of soldiers died because they ran out of ammo. The military then issued the M-16 rifle in 5.56mm/.223 Rem. Because the 5.56mm round is much smaller, the amount of ammo carried by the individual soldier was increased. The standard ammo carrying load for a soldier carrying an M-16 rifle was increased to 210 rounds. That is one (1) 30 round magazine in the rifle and six (6) 30 round magazines on their person. Depending on the combat mission, a soldier may carry more ammo but 210 rounds was the standard ammo load. Neither my wife nor I are trained knife fighters or trained in archery. I am a retired Law Enforcement Officer and have seen many subjects that were involved in knife fights. Every one of them had very nasty cuts and stab wounds. This is NOT what you want in a TEOTWAWKI situation. You may not have a convenient Emergency Room to get the medical attention that you need. So if or when we run out of ammo, we wanted a tactical advantage over another person that may be armed with just a knife or their bare hands. At first I thought a machete, with its longer blade, might be a solution. After thinking about it, I wanted a longer reach weapon to keeps someone at a greater distance from me. So I thought, stay with military equipment and use a bayonet on my M-4 rifle. This would give me a longer reach. However, a bayonet on an M-4 rifle still did not give me the reach or control over the blade that I wanted. It would be difficult to use an empty bayoneted rifle to hunt and fish with. Then I thought, how about making a spear using the sheath knife that I carry. 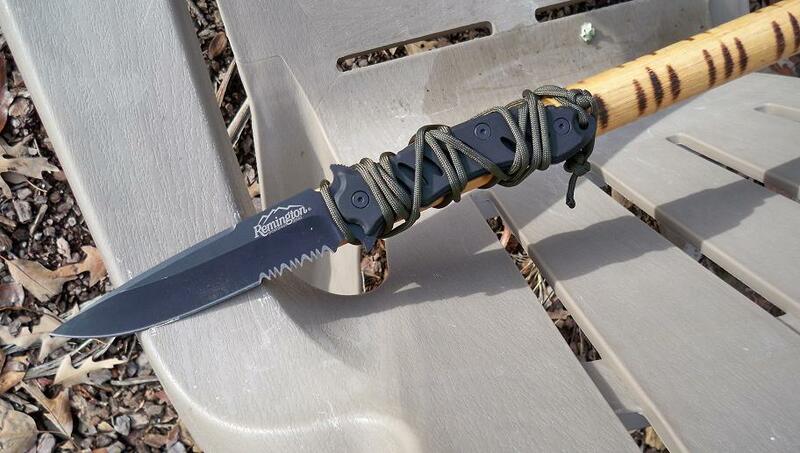 However, a knife is one of the most important items you can have in a SHTF situation. If you use your knife as the spear point for your spear and damage it that mistake could cost you your life. Using your knife spear, for hunting, fishing or defending yourself could leave your knife broken, chipped, dulled and useless. What if I need my knife for other chores while it was attached to a spear pole? I would have to take my spear apart then when I am finished with the cutting chore, I would have to reassemble my spear. Using my carry sheath knife as a spear tip quickly lost its appeal. I conducted some research on spear points and found many different types. Many of them were too bulky, large and heavy to carry in my bug out bag. I wanted something lighter, something that would not add much weight to our bug out bags. We use back packs as our bug out bags in case we have to leave our vehicle during a bug out situation and start walking for some reason. There are two (2) spear heads per pack. One is a plain edge and the second has a partially serrated edge. The spear heads are seven (7) inches long overall. The sharpened blade is 6 7/8 inches, 1 ¼ inch wide and 1/16 inch thick. Both blades are black and are made of 440A steel. A set of instructions, on how to mount the spear points to a shaft come with the spear points. 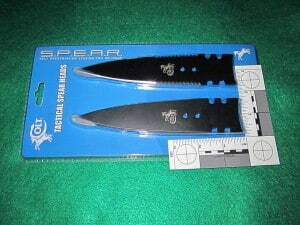 These spear points fit nice and flat, are light weight, compact and take up very little space in our bug out bags. They come in the blister pack, with what appears to be, a hot glue point protector. I highly recommend you leave these point protectors on until after you mount them to a shaft. These spear heads come VERY sharp from the manufacturer. The instructions state that you should use “a straight green branch” as a spear shaft. Using Paracord to attach the spear point to a wood shaft would work nicely. A section of paracord from a paracord bracelet would work well. Hopefully you have read an article that I recently wrote titled “The Knaw”. The “Knaw” makes a perfect size notch, in the top of a spear pole, in which to mount the spear point to the shaft. It makes a great companion to these spear points. Once you make your spear, you can use it as a defensive weapon or for quiet hunting, fishing, obtaining fruit and vines from trees. I am sure there are a lot of other uses for a spear that I have not mentioned. They can also be sharpened just like a knife blade in case they get dull. Well, you say that one of the solutions to the problem of running out of ammunition in a bug out situation is to carry more ammunition! While this is true, you need to determine how much weight you can carry over a long distance. Here is the test that you absolutely need to do! Think, you are bugging out in your car, your car breaks down, you run out of gas or any of another hundred reasons, you are reduced to abandoning your vehicle, taking ONLY what you can carry on your person and walking out. Get your bug out bag, the firearms and magazines, ammunition, knife and everything else you plan to carry, ON your person, during a walking bug out situation. Now weigh of all of those items and get the total weight. Take a back pack and place the total weight of all of the items that you plan to carry, in a walking bug out situation, in that pack. You can use water bottles, rocks or anything you want as weight in the back pack you plan on using. On a good weather day, put the back pack on with the total weight of your equipment in it and start walking. As you are walking, for every mile you walk, sprint 100 yards then without stopping continue walking. See if you can make a minimum of 5 miles. IF YOU CAN NOT DO THIS, YOU NEED TO LIGHTEN THE LOAD YOU PLAN TO CARRY! So what items do you plan on eliminating out of your bug out bag? Ammunition weighs a lot. However, you can never have too much ammunition. Even using a semi-auto M-4, that trigger finger does a lot of wiggling in a fire fight causing you to use up a lot of ammunition. Making a viable spear is just another option. I know, a bow and arrows give you range over the spear. However, if your primary bug out weapon is a firearm, when you run out of ammo, it will take you a long time to stop and make a bow and arrows shafts. This will take a lot longer than making a spear shaft. Also, when you launch an arrow, sometimes the arrow gets lost, the arrow shafts break or the bow strings break. The spear is a very durable weapon. Remember, prepping is about having as many options as you can have! 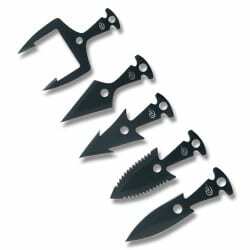 These arrow heads and spear points are light weight, slim and easy to add to your bug out bag. NOTE: I DO NOT receive ANY compensation, of ANY kind, from ANY company, for mentioning ANY product, named in ANY of my articles. I write about products that work for me. That was a great review. I completely agree with you on people’s overestimation on how much weight and gear they can pack when they have to take the ‘heal and toe express’. I just sent out a reminder to our neighbor hood Emergency Prep folks to do the same thing with their go bags, and received quite a few “I had never considered that” responses. I even recommend that hey carry a large tool of some kind to give them the feel of carrying a loaded rifle on their trek. I am going to definitely check out the spear heads, thanks for the heads up! My ammo lode was 300 rds. – Ten 30 rd mags. Only ran out once in two tours. I hike ever other weekend with my full bag and make my girls do the same. I carry a d-shovel to simulate my weapon. Spears – a couple of years ago I thought about that – my solution was to buy a cheap “survival knife” the type with the hollow tube handle. It fits any 3/4″ shaft and I drilled two holes for retaining screws ( kept in the handle until needed). Works well, is lite and can still be used for other things. Cold Steel makes some interesting spear points and spears. I was unaware of the Colt spearpoints and will have to order a pair. A proper survival knife will work as a spear point and likely be uninjured from the hard usage. Thanks for the tip Coach. Re ammo load. My EDC bag includes 40 rounds of .45acp and 8 rounds in the pistol. Most of my vehicles are equipped with a M1A Scout and a .50 cal box of 7.62 in magazines, an additional 100 rounds of mixed ball and hollow point pistol ammo, and a carton of .22LR. Ammo load out would be situationally dependent but would likely always have more ammo than could be carried. I also keep a 10-22 in my vehicle lockboxes, hence the .22LR. Leftover ammo would be consolidated in the now partially empty .50 box and buried against the chance of passing by again. I guess if we are talking load outs for EDC and Get home bag, then I should have included mine. EDC Ammo. 13+1 of .45 ACP on my hip, with a spare 13 in an extra magazine. In my vehicle I have 100 rounds of FMJ, and four more 13rd magazines loaded with a mix of FMJ, hollow point, and birdshot on a vest. My vehicle has my 590A1 over folder with 5+1 12G in a scabbard that can mount to my bag. also attached to the vest is a 12G ammo holder with 26 shells of 00, slugs, and #4 shot in it. I keep a coat and a light jacket in my vehicle so I can be somewhat discreet. My bag is not so discrete as I use a USMC MARPAT bag to keep my gear in. Weight will change when I add the level III / IV plates to it, but for now it is a comfortable weight. I do plan to follow Coaches instruction on walk / run for 5 miles though and will see how that impacts me. I like that for a metric to evaluate my gear weight though. Reminds me of field drills, and will be a useful standard of measure. If I am on foot, then I will not be returning to my vehicle until after the emergency has ended, so I don’t have plans for recovery of ammo, but I like the idea. I have thought about swapping out the 590A1 for an AR, but I like the power of the shotgun. My edc is 10 in the pistol, one extra 13 round mag of 45 on my person. Four more 13 rnd mags in my carry bag, and a 100 rnd box in my truck in my go-bag. Speaking of the Walking Dead, my son had an interesting question…who is it that has been mowing the grass in the neighborhoods they visit?? Just wondering. An oak dowel 1 ” in diameter with the blade from one of the black handled Swiss bayonets that are selling for a measly $30 or less all over the Net fixed in a simple straight saw cut in one end with two holes appropriately drilled makes a spear you could take anything with, at least on this continent. The First Americans, who may have come to Alaska as long as 20,000 years ago took on bears with nothing more than a sharp rock tied into a strong stick. THE BAYONET BLADE IS CONSIDERABLE LONGER AND HAS A HIGH GRADE OF STEEL THAT WILL TAKE A RAZOR SHARP EDGE. And by getting a 1′ pipe cap and cutting a slot in it that will just clear the blade, you can gorilla glue and gently pound it down to the end of the stick. You may need to shave a small amount off the staff, but it’ll go. Then get another cap and twist it on the rear end. This is to break ice and heads with, and makes the whole thing much more lethal.